By Julie Ferraro and Suzanne Hammons. Photos by Julie Ferraro. At just 14 years of age, Andres Gallegos joined the Franciscan order. Gallegos grew up in Guanajuato, Mexico. One day his uncle, a Franciscan, brought some friars to Guanajuato to preach and teach the Catechism to local kids. It didn’t take long for Gallegos to discover an attraction to the work of the friars. He spent his school years as a lay member of the order, and later joined as a novice at age 22. Eventually he moved to the United States, joining the Franciscan Province of Our Lady of Guadalupe in 2001. This province was established in 1985 and primarily serves Navajo, Pueblo, and Hispanic peoples of New Mexico and Arizona. In the last century, the number of Franciscan priests in the Southwest has decreased, and the decline in numbers was not lost on Gallegos. A little over a month before his ordination on August 15, 2015 , the province assigned Gallegos to Gallup, where he worked at St. Francis parish. On the Feast of the Assumption at Holy Family Parish in Albuquerque, the Franciscan Friars of Our Lady of Guadalupe, friends, families and guests gathered in the church to see Gallegos ordained to the priesthood by Santa Fe Archbishop John C. Wester. 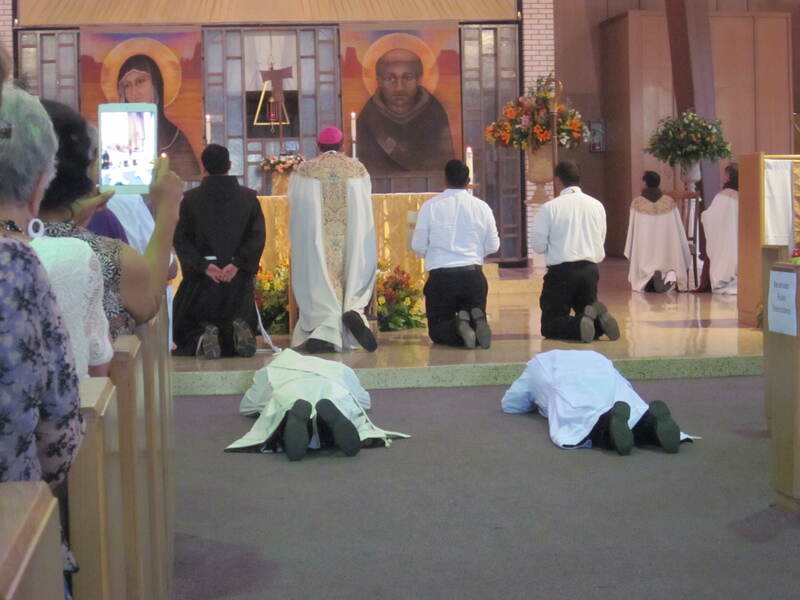 Andres Gallegos, OFM – left – and Jorge Hernandez, OFM, prostrate themselves during Litany of the Saints. The Missionaries of Charity and other Sisters were also in attendance, traveling from Gallup for the occasion, in support of Deacon Gallegos. The Mass, mostly in Spanish, celebrated Gallegos’ commitment to his vows as a Franciscan, and vocation as priest. During the procession into the church, Gallegos’ parents accompanied him, pausing at the edge of the sanctuary to bless their son. The couple, in turn, was thanked by Archbishop Wester and Fr. Jack Clark Robinson, OFM, provincial minister, for giving their son to God’s service in this special way. Called forward by the Archbishop after the Gospel, Gallegos prostrated himself as the congregation sang the Litany of the Saints. Beside him, Brother Jorge Hernandez awaited his own ordination as deacon. Archbishop Wester laid hands upon Gallegos, followed by the other priests – Franciscan and secular – in attendance. Then, his hands were anointed with holy oil, after which his parents assisted him into his set of priestly vestments. Accompanied by heartfelt applause, Fr. Gallegos was embraced by all the Franciscans present before the Mass continued, during which he concelebrated with the Archbishop at the altar. Following the recessional, a reception was held in Holy Family Parish hall for the newly ordained, before Fr. Gallegos returned to Gallup to assume his new duties at St. Francis Parish. Now, Fr. Gallegos says, he is ready to serve the Gallup community. But in order to help his parishioners, Fr. Gallegos must also have the opportunity to grow in his own spiritual life. This opportunity is readily found in Gallup, as well as time for his new favorite priestly duty – writing homilies. Gallegos’ spiritual service with the Franciscans, begun in childhood, has started anew as a priest.